Perhaps better than anyone else, Fidel Castro was keenly aware of the fact that the histories and destinies of Cuba and the United States were profoundly intertwined. A fascinating and virtually unknown document housed in the US National Archives and Records Administration demonstrates that Castro was aware of this from an early age. 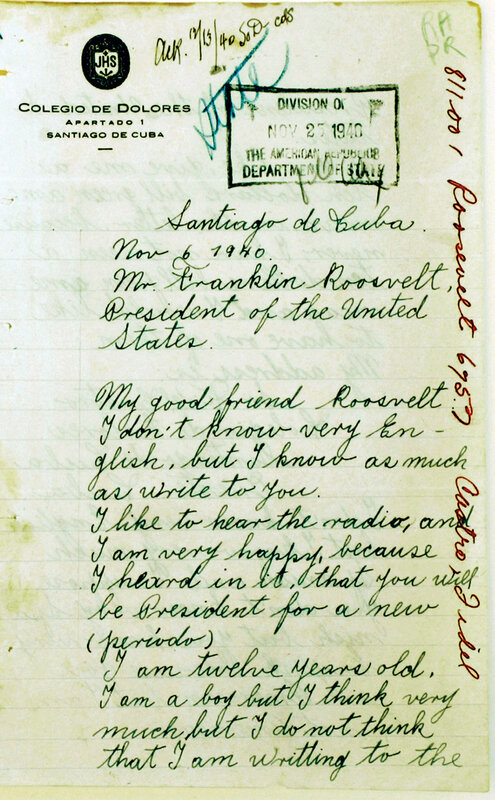 ‘My good friend Roosvelt’, opens a letter a young Castro sent to President Franklin Delano Roosevelt, written on 6 November 1940, the day after Roosevelt’s second landslide re-election. As a student at the Jesuit-run Colegio Dolores in Santiago, Castro heard the news on the radio and sat down to write a letter of congratulation, three pages long, in neat cursive but broken English on the school’s official stationary. Castro told Roosevelt that he was 12 years old but, according to his ‘official’ birth date, 13 August 1926, he would have been 14. For decades, Castro’s birth date has been the subject of speculation and debate and it is possible that his father, Ángel Castro, bought a forged birth certificate with the object of presenting Fidel as a ten-year-old, the minimum age required for admission to the fifth grade at Colegio Dolores. The all-boy Colegio Dolores was one of Cuba’s most prestigious schools; certainly, the most respected in Santiago, Cuba’s second city. Its rosters included the sons of some of eastern Cuba’s wealthiest and most prominent families, among them, the Bacardís, Casas and Cubeñas. 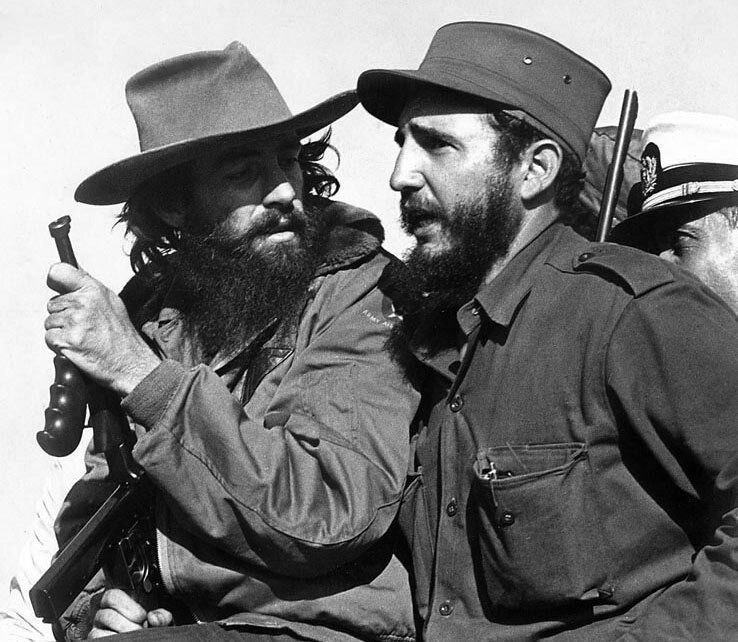 Castro and his two brothers, Ramón and Raúl, were social outcasts. They had a wealthy father but carried the stigma of illegitimacy. While married to María Argota, Ángel Castro sired Fidel and six other illegitimate children with Lina Ruz González, a maid at the Castro household, 30 years younger than Ángel. The Castro boys grew up in an uncomfortable and often humiliating social limbo. Because of their low social status and rural origins, many of their classmates looked down on them. Fidel resented this and sought recognition and admiration by excelling in academic study and sports. One of the most striking aspects of the letter to FDR is its familiar tone and the fact that at such a young age Castro addressed the world’s most powerful man almost as a peer, with respect but without flattery or exaggerated praise. On its second page, the precocious Castro gets to his main point: ‘If you like, give me a ten dollar bill green American’ – not for chocolate or cinema tickets; it was a matter of curiosity, because he had never seen such a bill. Fidel closed his letter to FDR in a friendly and familiar tone, thanking him in advance and signing off with the words ‘your friend’. The letter is signed ‘Fidel Castro’. That was not his actual name, however, as his father, still married to María Argota, had not recognised any of the children he had with Lina. At the end of the letter, most likely as an afterthought, is a postscript obviously crafted to increase his chances of getting Roosevelt’s attention and that ten-dollar bill. ‘If you want iron to make your sheaps’, he wrote, later crossing out the error and writing ‘ships’, ‘I will show to you the bigest (minas) of the land. They are in Mayarí, Oriente, Cuba.’ The American-owned Spanish-American Iron Co had been extracting and processing iron ore there since the first decade of the century. Perhaps to his surprise, Fidel received an official response on White House stationery. He showed it off to his schoolmates and it ended up on a school bulletin board. According to historian Luis Aguilar, who attended the school at the time, Roosevelt’s response was the trophy that catapulted Castro to a position of popularity and admiration. Despite this, Castro was angry that FDR had not sent the ten-dollar bill and had rejected his offer to show him Mayarí’s iron mines. Aguilar quoted Castro as saying ‘the Americans were assholes’. He would never again refer to a US president as his ‘friend’. It would be an exaggeration to claim that this exchange was the genesis of Castro’s unremitting anti-Americanism, but certainly the experience did not augment any admiration that he may have had for the US. In 1959, Castro may have remembered what transpired 19 years before, when he travelled to Washington to meet President Eisenhower. His delegation’s main objective was to secure financial support from the US government; but, tellingly, Castro told his Finance Minister, Rufo López-Fresquet: ‘I don’t want this trip to be like that of other Latin American leaders who always come to the US to ask for money.’ The ten-dollar-humiliation may have had some conscious or unconscious influence on his decision to avoid the embarrassment of asking for money and being rebuffed. Eisenhower did not extend the courtesy of meeting Castro personally; he opted to play golf that day and left Vice-President Nixon in charge. Castro did not ask for support and Nixon did not offer it. Whatever prospects may have existed for a friendly coexistence between revolutionary Cuba and the Colossus of the North were destroyed that day. Castro felt he was treated like a child. He came out of the meeting visibly angry, complaining ‘this man has spent the whole time scolding me’. Whatever the long-term impact of 14-year-old Castro’s anger at being denied the requested ten-dollar bill, the Eisenhower administration’s failure to offer the 33-year-old Castro a few million dollars’ worth of support gave perpetual headaches to the next 11 US presidents and was to cost billions of dollars and a number of lives over the next six decades. Luis Martínez-Fernández is Professor of Cuban and Caribbean history at the University of Central Florida and the author of Revolutionary Cuba: A History (University Press of Florida, 2014).